Helen Sketon on her Hanebrink ice bike. Courtesy BBC. Earlier this week I randomly received an e-mail from Kane Fortune, the president of bicycle-maker Fortune Hanebrink, asking me if I wanted to revisit my conclusions about British television personality Helen Skelton's 500-mile multi-sport trip in Antarctica. I thought, yes, it would be good to follow through on this. 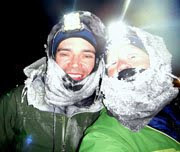 Helen successfully completed her expedition to the South Pole on January 22. Her methods of travel included 329 miles (eight days) of kite skiing, 68 miles (three days) of skiing, and 103 miles (seven days) of biking on a custom Hanebrink ice bike. I and other snow bike enthusiasts were critical of the media coverage of Helen's expedition, which perpetuated several unsubstantiated claims (such as the "longest bike ride on snow" and "first bike ride to the South Pole," which was not even one-fifth true given the start at an arbitrary point 500 miles from the pole.) Some snow bikers also questioned the practicality of that particular brand of bicycle, which I'll address soon. However, I was enthralled by the adventure of Helen's trip, and followed her progress with interest despite what I viewed as anemic coverage on the BBC blog. I also watched parts of a couple of episodes of her television show online, but I admit I don't have much patience for the standard filters of reality television. However, if Helen ever writes a book about her adventure, I'll be the first to buy it. She was absolutely successful in what set out to do. But after the completion of her trip, I continued to question just how much Helen and her partner really "rode" their bikes. Their final tally was 103 miles over seven days, which is an average of 14 miles per riding day. On the anemic BBC blog, Helen dropped a few hints about the difficulties, calling the Hanebrinks "push bikes" and admitting their her partner, a champion kite skier, thought the bikes were "a little silly." On the first day of the expedition, they stopped after riding 15 miles and indicated they had put in a long day to make it that far. Most of the other bike days also were depicted as long and arduous. I understand that high winds that could slow a bike down to two miles an hour might slow a walker or skier down even more. But I think even the most avid snow bikers would question this level of progress ... if it's consistently harder and slower than walking, what's the point? I'm among the few who have wondered how viable a bicycle might be for explorations in frozen, wild places such as Antarctica, the North Pole, Greenland and Baffin Island. Not merely out of personal interest, although I'd be lying if I said I wouldn't jump at any opportunity to travel through these endlessly intriguing corners of the world. One of my big motivators for finishing the past two Susitna 100 races on foot was to experiment with long-distance foot and snowshoe travel (For me personally, walking and running are a more enjoyable, versatile and even more efficient method of travel than skiing has proven to be, but if I ever receive a serious invitation to an Arctic ski expedition, you can bet I'm going to do everything I can to develop skiing technique.) But I digress. The big question still remains: Is it possible to ride a bicycle, entirely self-supported, from the Antarctic coast to the South Pole? A decade ago, Dan Hanebrink developed what might be the first bicycle designed specifically for an Antarctic expedition, an "ice bike" built for Antarctic adventurer Doug Stoup. The ice bike was included among Time's "Best Inventions of 2003." Stoup supposedly rode the bicycle 200 miles of a 300-mile trip before he was shut down by high winds, and hasn't tried it again. There were reports that he had been preparing to take it to the South Pole, but little information about why Stoup hasn't yet attempted another bicycle expedition amid his continuing ski trips in Antarctica. In Internet chatter, the general assumption seems to be "because the bike didn't work the way he thought it would." Again, I don't know many of the details, but the fact remains that no person yet has actually completed a full, self-supported ride from the Antarctic coast to the South Pole — which is the generally accepted explorer's standard to qualify as "the first bike ride to the South Pole." No one has taken a bike to the North Pole or any other major Arctic winter backcountry traverse for that matter, at least not publicly. There are some who have expressed interest and others who have publicly expressed interest and put a lot of time, effort, experience, and knowledge into such an expedition. While it goes without saying that securing funding for such a major undertaking is by far the biggest obstacle, the logistics of the bicycle itself also present an interesting puzzle. What feedback did you receive about the bicycles after Helen and her partner returned from Antarctica? Did they make any suggestions that you would incorporate into future designs? Fortune: As with Doug Stoup's 2003 trip to Antarctica, the bikes were very successful on Helen's recent trip. What this teaches us about future designs is that we must continue the mission that Dan Hanebrink began in 1991 and that is to build the best bike for riding in the snow and soft terrain. We must continue to build our chassis and wheels as strong and light as possible and to build relationships with various parts suppliers for the highest quality and most durable components in all conditions. Helen's riding partner was a world champion kite boarder. You can bet that if Dan or I (champion and competitive cyclists respectively) were on the trip, we would have spent much more time in the saddle and less on the board. Did you design the bike in order to accomodate pulling a heavy sledge? Fortune: Designed as a backcountry snow bike, it is invariably a utility bike as much as it is a recreation bike. The Hanebrink has been pulling trailers and sleds since its inception. Before Doug's trip to Antarctica, he spent many hours pulling a tire behind his Hanebrink in the sand at Redondo Beach. Doug required Helen to do some training of her own, pulling a sled behind the bike in San Diego sand dunes. My understanding is Stoup did not reach his goal to ride to South Pole, and has not made another attempt. Has anyone else approached you about building a bicycle for another South Pole attempt? Fortune: Doug Stoup had a successful trip riding the Hanebrink more than 200 miles in Antarctica. His goal was a 300 mile ride of the bike (not a trip to the South Pole). Because of severe katabatic winds, Doug was forced to spend five straight days in a his tent, sleeping with his legs straight and strong to keep the tent from collapsing. Doug has since been very busy with expeditions and he would love an opportunity to ride a Hanebrink to the South Pole. In 2013, a Japanese adventure cyclist plans on riding a Hanebrink to the South Pole. We are also coordinating with a Spanish adventure cyclist about a future trip on his return from a trip crossing Greenland. What mechanical adaptations did you make for extreme cold? Were you able to test any of the mechanics in cold temperatures? Fortune: As an avid cyclist living in the winter resort town of Big Bear Lake, Dan first developed the Hanebrink in 1991 to be ridden on snow (much of the bike's early attention came from clients in beach communities for its ability to ride in sand) With the San Bernardino National Forest as his backyard, Dan has been building, riding, and testing in all types of conditions for over twenty years. While his focus is now solely building Hanebrink All-Terrain bikes and Electric All-Terrain bikes, he has developed many bicycle and motorcycle products since inventing the "Ice Bike." The Ice Bike is built without plastic parts and uses a mechanical brake. When Doug made his trip, Dan Hanebrink was still making bicycle suspension forks which he retrofitted for Antarctic conditions. In building the bikes for Helen's trip, White Brothers Suspension in Colorado would keep the fork legs in meat lockers during the building process to test their performance in cold conditions (these were the only new component we had not yet tested in Antarctica). A few of the days that Helen and her partner reported riding the bicycles, they logged less than twenty miles while reportedly cycling for eight to twelve hours. To an outsider, these bike speeds appeared to average less than two miles per hour much of the time. I wondered if you wanted to comment on this or correct any misperceptions. As someone who has done some long rides on snow trails, I know that "riding" at these speeds generally means pushing the bike — i.e. walking. Fortune: If the misperception is that she walked and not rode: We have no reason not to believe Helen when she has told us that she rode. (Living in Los Angeles, we are cognizant of how "Hollywood" can manipulate a story) Depending on the external environment, some miles may have been ridden as slow as two miles per hour, and some much faster. Built for endurance over speed, our eight-inch-wide tires can not only traverse terrain that no other bike will can travel, it also balances comfortably when forced to pedal at idle speeds unlike any other bicycle. Based on this last question, do you believe your bicycles or any bicycle for that matter can actually provide an advantage on the wild terrain of Antarctica over walking on snowshoes? Fortune: There is a momentum gained when riding that is just not possible when snowshoeing; especially pulling a sled. The snow bike industry is taking off right now, with a number of different "fat bike" offerings in North America. All of these bicycles' designs favor a style more similar to a traditional mountain bike. In lay-person's terms, could you explain a bit why you believe the features of your design are better for Antarctic riding? Also, do you think your bikes would perform well among traditional fat bikes in, say, an Iditarod Trail race across Alaska? Or are they specifically designed for the kind of conditions one might encounter in Antarctica, which from my understanding can be quite different from packed trails in North America? Fortune: Every type of bike —road, mountain, bmx, etc. — is suited for a particular type of terrain. Hanebrink is the only bike that rides in all terrains: deep sand, snow, streets, steeps. The standard "fat bike" is a mix between a standard mountain bike and a Hanebrink All-Terrain bike. A standard "fat bike" will ride better in the snow than a standard mountain bike and a Hanebrink will ride better in softer terrains (snow and sand) than either a "fat bike" or a mountain bike. Riding successfully in soft terrain is a matter of tire floatation. The less pounds per square inch, exerted from the tires over the terrain, the more success you will have riding over the soft stuff. Our bikes at three pounds per square inch, fully loaded, have the lightest footprint of any wheeled vehicle in production. In the softest possible riding conditions, the air pressure in our tubeless tires is let out to 4 psi and when traveling on paved roads our tires are pumped to 18 psi. For any surface in between, the tire pressure can be adjusted accordingly. Fat bikes are designed for snow packed trails and have proven successful over many years in the Iditarod traveling on the frozen rivers and hard-packed snow. They are not designed for the deep backcountry snow that our bikes are designed for. There have been some years (at least one) where the bikes were walked more miles than ridden during the Iditarod because the snow was too deep. We would love to see a Hanebrink in competition during one of these years. I appreciate Mr. Fortune taking the time to answer my questions. I realize winter backcountry expedition cycling is a highly esoteric subject, but if you have an opinion on the matter, please comment. Perhaps Mr. Fortune will check in and answer more questions as they come along. "Helen dropped a few hints about the difficulties, calling the Hanebrinks "push bikes"..."
For what it's worth, pushbike is quite commonly used in British English (by non-cyclists at least...) to differentiate pedal-powered cycles from motorcycles. Thoughts? I'd say if you're going to be the first person to bike that road to Anarctica, you'd better get on it! Seems like that carrot is still dangling out there. Based on a documentary I saw about a ski across the Arctic, crossing the North pPole, I'd say a bike ride across that would be heinous beyond belief. There are massive cracks and fissures everywhere. Would you be interested in using a Hanebrink All-Terrain bike in an Alaska race, if it was offered? To be fair, you have to be a bit unlucky wit the weather in an Alaskan race to take advantage of this bike. It is easy enough to assess though how much more float you get by veering on less used trails. I am unclear how much more of the ITI would have been bikeable with the H bike - certainly it cannot cope with waist deep snow, it'd be interesting to see. I think one has to get lucky to get a real advantage. On breakable crust kind of snow it might be there. The claim that the tires have that much more float is unclear to me - fatbike wheels probably have a significantly longer contact patch length at low PSI than the H wheels, which negates some of the advantage I would assume, and the narrower width of the fatbike may actually be good in some conditions. The tubeless design of the H bike seems both good and bad - if the tires break, you're screwed, but they're less likely to ... or so one would hope. I'm going to agree with Beat on this. I do not belive these bikes would serve a greater purpose than a normal fat bike. They would be slower in almost all situtations. These bikes could not ride in two feet of unconsilidated powder (no bike can). The only time I can think these bikes would be of greater service would be in a snow depth of maybe 6-8 inches or when there was a crust that was solid but not solid enough for a fatback. It weighs way too damn much to be good for anything. Signed, owner of 21 lb fat bike. Question: I don't really buy the "lightest footprint" argument; 3psi is 3psi, yes? How is 3psi on his bike any different than 3psi on my (21 lb by the way) bike? The Hanebrink web site states "outperforms all other fat tire bikes on soft terrain." I would like to know on what basis he's making that claim, and to give it a good real life test. I also think it's reasonable to consider things like maneuverability and speed. Not all snow biking is done at slog speed. Actually, most snow biking is NOT done at slog speed. Acceleration and handling matter, too. I just can't see the Hanebrink being any fun at all on technical or fast trail. OK, a little bit of fun, because bikes are fun. But I don't think it would outperform my 9:Zero:7 in general. Let's get one and try it! I have a question for you or Fortune, and I apologize if this has been answered earlier and I missed it: why do the tires need to be so small? Is it weight savings? If so, wouldn't a larger tire of a similar width offset that up to a certain point by carrying better momentum? Jill, sounds like a worthy challenge for you! I've never given to a kickstarter before but I'd sure pitch in to see you bike to the SP. Dan, yeah, for obvious reasons the terrain in Antarctica and the Arctic ice cap are quite different. I don't think anyone has seriously entertained the idea of taking a bicycle to the North Pole. Overland routes on breakable crust, however, are doable and bikes in theory could provide an advantage over walking. Jerry, if I was sponsored to ride a Hanebrink in Alaska, I'd certainly give it a try. I'm pretty sure I'd prefer my Fatback, but I am open-minded and always looking for an avenue to a good story. It would be an awesome test ride. You heard it here. Get that sponsorship set up! Kane Fortune - sponsor Jill to ride to the South Pole. She's got the credentials, she's personable, and she can write. The perfect combo. For a 29" and 4" wide tire at the lowest pressure (and help us out, 20 or 25 psi?) then the contact spot will be about 8" long and 4" wide, or about 32 square inches. At low psi for soft snow or sand riding, which is somewhere between 3 and 8 psi, we end up with about the same length, 8" but with an 8" width contact zone, or about 64 square inches. If we take our tires at full pressure, the length drops to about 3.5" - 4" and the width drops to about 2" - 2.5" for a contact zone that is only about 10". While this is way less than what you can get with low pressure on a 4" wide fat bike, interestingly, it means that on hard surfaces the tires develop more of a crown and end up rolling really well. This matches our experience riding, as well as tests from Mountain Bike Action. Once you have the contact zone, take the total weight of the bike and rider and divide by the contact zone to arrive at pounds of pressure over square inch, which will output an estimate on floatation. Regarding downhill speeds and handeling, Dan Hanebrink placed 2nd at Mammoth Kamikaze Mountain Bike World Cup on a Hanebrink All-Terrain. We love to ride them fast. My question is whether they have gps records for the "cycling" days so we could see what really happened out there. It sounded like a great adventure! Put your money where your mouth is. Give somebody well know and trusted in the biking world - Curiak or Homer for example - and let them put the bike through the paces for an entire winter. If it's better, they'll share it with the world. If it's worse, same deal. You want to change the world...start with the core. Great blog, I'd discover recently. Just to tell you that spanish Juan Granados is goint to cross Groenland by bike this days. Ken, "Normal" Fatbikes ride way lower pressures than the 20 to 25 psi you use in your example above. It is very common to see 5 psi and as Geargal said some have gone as low as 3. At 3 psi the contact patch on the two types of bike will be the same but the shallower approach angle of the bigger tire should roll over obstacles easier. Jill, the Top Gear guys drove to the North Pole a while back, so surely biking there is feasible. Thanks for the replies! I'm enjoying the discussion. KB — I don't know about GPS logs and don't know what that would prove. The team says they pedaled much of that mileage. I can believe they did. When you consider the possibility of high headwinds they may have even been forced to slow speeds on more solid terrain. I think they chose to use the kites whenever the winds were remotely favorable. TimD — not sure what kind of vehicles you're referring to, but vehicles and humans have vastly different capabilities in terms of power. Some vehicles can efficiently traverse terrain where humans struggle to walk. The North Pole is known for open water leads, huge ice shelfs and other broken ice obstacles that can make even skiing extremely slow and dangerous. Google images of "North Pole terrain" for some ideas. And of course none of these obstacles can be mapped, so for any North Pole expedition you'd have to be prepared to carry and lift your bike over miles of broken ice, in addition to your sledge. Top Gear used modified Toyota pick-ups. Modifications were larger snow wheels and mods to the suspension and bodywork to cope, lower gear ratios and mods to cope with the cold. Probably their biggest asset though was access to good satellite images so that they could plot a drivable route. They also had a rescue plane on standby just in case. Simon Rakower, of snowcat rim fame had a Hanebrink in his bike shop in Fairbanks in the late 90s. I think he had a hard time selling it (if I remember correctly he had it in his shop for several years), but sold a lot of snowcats.. which is probably an indication of well they rode on snow. Top Gear drove to the magnetic north pole, which is inside the eastern Canada archipeligo, about 750 miles south of the geographic north pole. I can't say much about float, but I will say this: bikes with huge, heavy, small diameter tires ride a lot more like a "normal bike" than you'd expect. They are reasonably nimble in terms of acceleration and cornering. But in the backcountry being able to actually carry your bike over big obstacles is essential. That's the main advantages bikes have over motor-vehicles. Hanebrink sacrifices this. You couldn't imagine anyone doing a Lost Coast expedition on a hanebrink. Jill, why would it have to be a "self-supported" ride? It seems it would be quite a feat just to ride the entire way to the south pole. Most of the expeditions are going to have some amount of support, even if it is just having drops of supplies.